Not only did the iPhone beat it… it also doesnt explode. That’s crap running top third party apps to degrade the greatest note 7. That’s just absurd. I will insult Apple the big way sell my 6s plus and buy note 7. Like I said before: I’m a huge Apple fan, but I’m not blind or stupid! Try doubling the video resolution on the iPhone and see how it goes. Come on! And you call yourself experts? How about being a little impartial here? A little racional? Yes, iPhones are amazing! The Galaxy Note’s are amazing as well! The OLED display is stunning! It’s resolution is fantastic! IPS won’t ever be match for it. It’s frustrating when you expect to watch some serious review and watch this instead. Hey, at least the Note 7 didn’t explode, amiright? those are real world tests why get upset because the note 7 didn’t stand up to the test. it has a bigger screen but also more ram to offset that. dont blame apple for making a faster more superior phone. How will doubling the resolution change anything when the note 7 was still stuck on a games splash scren while the i7 had finished loading and quit back to home screen? iOS is more optimised than android so iOS will always win. How doubling the resolution would change anything? Are you serious? I’m note blaming no one for nothing. I’m trying to be a little reasonable here. There are a lot of things to be considered if you want to call a winner on this contest… display resolution is just one of them. Of course iPhone’s hardware and software integration allows it to use everything it has. well samsungs phone is suppose to be optimized as well. You can check his other video where he downscales the Note 7 to 720p resolution and puts it against the Note 7 2k. The same thing happens. 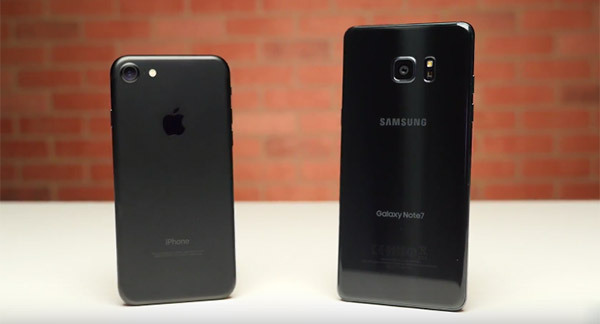 Android phones will never get even close to what Apple does. Everyone knows that. Look, I don’t even use a Samsung! lol I’m just sick of this fanboys reviews. I don’t know about everyone, but when I watch a Redmondpie review, the only think I expect is honesty. If you watch the video, you’ll see that nothing changes at all. The processor has to work to downscale de video to 720p. That’s why nothing changes. It just doesn’t reduces the processor usage. Screen resolution won’t help. Go check out a Speedtest vs a nexus 5x that has 1080 screen. That will prove your theory wrong. I’m just saying that these “real life tests” are BS. If you dont have enough processing power, why you choose a 2K screen and having a bad user experience? That why I always not suggest my friend to buy a Galaxy. This is a real life tests. You buy the phone, you use it, using same as the video. I am a programmer, I know computer, I know the maths. I know the theory. But that is the combination they made. It failed. How would you compare them?? Even though the iPhone 7 would run at 1440p it wouldnt change the loading times since graphics/display are GPU bound. Sorry but even the 6s blows the upcoming S8 out of the water when it comes to opening apps thanks to its faster flashmemory and singlecore performance in combination with perfect OS optimizations. Period. Honesty? They are the worst tabloid on the tech industry, on the payroll for Apple. Just look at the last twenty articles they’ve published – almost all Apple Apple Apple. You’ll not see this bias at other reputable tech blog sites. Yeah based on the fact like I just said… The note was still on the splash screen while the iphone had finished wow that splash screen was ultra 4K with 16 billion colours was it? Good, I’ve ordered an iPhone 7 because I’m sick of the laggy crap my S5 is giving me. Looks like my experience will be as fluid as I’ve been hoping! So… Generally, gaming apps perform better in the iPhone. Same old story. And PLEASE, the Note 7 is a quad core, and the iPhone is a dual core. Stop with the BS. Samsung uses octa core processor in S7 and Note 7. Having 8 cores, and being “an Octa core processor” are two different things. For all intents and purposes, the Note 7 is a quad core, because it only ever uses 4 cores at the same time. The iPhone is a dual core, because it only ever uses 2 cores at the same time. And keeping apps in the background. Explain to me how the iPad pro was able to beat the iPhone 6s, then. iOS and Android handle apps in the background completely differently. Can’t really compare those. Loading websites? Depends on the browser you are using. Who edits video on a phone? Answer, people who don’t care about performance. I hope you have a “fiery experience”, as we disgruntled samsung customers say. Even my nexus can do better memory management. Loading websites, not true in the case of ios. Just depends on how aggressive you prefer your memory management. Unfortunately, that memory leak on the S6 forced Samsung to make their management a bit too aggressive. And they haven’t really come back from it. iOS will always be able to keep more apps in the background because they suspend virtually all apps, and keep none in the background. And only if you use Apple’s browser. If you prefer Chrome for example, because it syncs your passwords and bookmarks, Android is much better. Watching people defend Samsung is hilarious. The note 7 is garbage. Chrome is a battery hog. Don’t remember saying it wasn’t… Just that if you prefer it to Apple’s stock browser (not hard) than its better on Android than iOS, simple because Apple doesn’t allow the same system access. Ppl didn’t edit on the go before because they couldn’t. People who care about video editing performance don’t edit video on a phone. If you edit video on a phone, most likely you are perfect happy with whatever platform you use, be it Android or iOS. This is wrong. Apps can run services for 10 min, after that longer things like transfers have to be handed off to system services. IRL it’s the best of both worlds. Plex still syncs new episodes for offline use and clears them out after I watch them. I agree to some degree about oled performance but I do agree with apple on diminishing returns on ppi vs battery vs perceived sharpness. Only if the app request an exception to the rule. If your Amazon video download takes more than 10 min, you are out of luck. Only a select few apps and APIs can run in the background indefinitely. They handle it differently because Android apps don’t have to request an exception, and can run indefinitely. Therefore, RAM management on Android is more difficult, and can vary significantly from manufacturer to manufacturer, because it is up to them on how it operates. And not sure what you are trying to say about Chrome.. I am well aware that Chrome is on IOS, Apple also finally allowed it to be competitive with Safari only this year as far as speed and stability are concerned. Again, that’s not true, amazons app hands it over to a system daemon and it finishes. That’s how plex works as well. And last year for chrome getting nitro. Again, people don’t buy phones to edit videos. Not a hard concept to understand. Know what else people don’t buy phone to do? Open a bunch of apps one after the other without using them. again, because it’s not easy, but if i can dump raw photos to my iphone via usb 3 sd readers, and take making a timelapse out of the workflow, that’s awesome, and easier to share. I don’t see why it’s not something people would do, especially to cut down less interesting parts of footage. Speaking of timelapses, they actually made one in the video, (using the app). wrong again! How long did you own the Note 7 before deciding it was garbage?